It is of the utmost importance to ensure that the integrity of your commercial or residential roof is in great shape before the harsh winter sets in. While Nashville doesn’t get pounded daily with snow, winters here are not to be discounted. 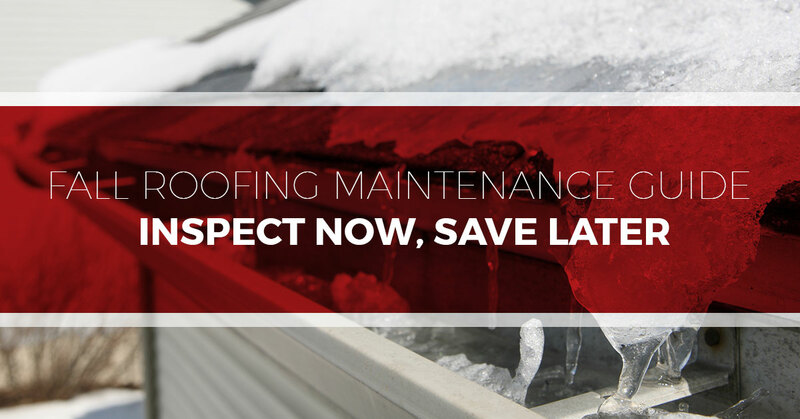 Snow and ice can easily exacerbate any minor roofing issues, turning them into big issues that require costly repairs. Leaves and debris are the most common culprits for clogging your gutters and drainage system, and at no other point are there more leaves than in the fall. Because of this, it is crucial to clean your gutters, scuppers, downspouts, and roof, making sure that everything is clear and free-flowing. Clogged drains lead to pooling water, which in the winter could mean heavy ice dams and a total roof collapse. Additionally, when cleaning your gutters, look for loose granules. If you notice an excessive amount of granules, this is an indication that your shingles may be worn and damaged. Severe granule loss can lead to ultraviolet degradation of the membrane. While this may not mean you need a total roof replacement, it may be a sign that you need to recoat the bare spots with new granules and adhesive. External units that are connected to your roofing system are a common occurrence for both residential and commercial roofs. These are also extremely vulnerable points that are susceptible to leaks. Be sure to examine all the pipes, chimneys, skylights, conduits, wires, and any other feature that is penetrating your roof. Flashing helps keep water out of vulnerable areas and helps to direct water, allowing it to properly drain. This is an essential part of a roofing system, and it is vital to determine how long your roof lasts. When inspecting flashing, don’t just look for rusty spots, loose pieces, splits, tears, and other damage. You should also look for flashing that is improperly bent. This is where it may help to have the trained eye of a roofing contractor. Additionally, flashing is relatively cheap, and when in doubt, it’s best to replace it. The roofing membrane is crucial to the function of any roofing system. It’s responsible for keeping water from entering your interior. Before the harsh months of winter come, it is imperative to examine the condition of your roof membrane, ensuring that it is free of splits, tears, holes, and any other signs of wear and tear. Also, be sure to look for any shingles that are buckling, curling, blistering, or loose. Although sealants are not the first line of defense against leaks and water damage, they are important. Be sure to carefully inspect the condition of sealants around mechanical equipment, pipes, pitch pans, copings, and any other potential entry points. While performing a roof inspection, it is important to remember to tread lightly and don’t treat your roof life any other walking surface. Avoid dropping tools on the roof and Not only is walking on the roof potentially dangerous, but it can also lead to inadvertently damaging shingles and other damage. Also, be sure to always practice ladder safety. Most roof damage cannot be spotted at ground level. If your roof inspections typically entail you walking into your yard, taking a few steps back, shielding your eyes from the sun with your hands, scanning the roof, and concluding “all good here,” this is not enough. If this is what you do, it is in your best interest to contact a professional roofing company. They can provide a thorough analysis of the state of your roof and catch any minor nuisances before they become major problems. Skipping your fall maintenance inspection can put a serious damper on your winter. Conversely, following these simple steps can help prevent damages that require big, costly repairs. Let’s not let this happen to our homes, Nashville. Deal? Perfect! We knew you would be on board. So, before fall is over, let’s clean the gutters, look for any of the above-mentioned issues, and address any potentially problematic areas of your roof. If you need help performing your fall roof inspection or need commercial or residential roof repairs, contact us today at 615-553-2782.